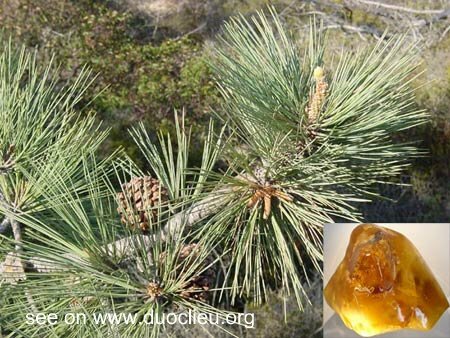 Part Used & Method for Pharmaceutical Preparations: The brownish fossil resin is taken from a pine tree which has been buried underground for a long time. It is then ground into powder. Meridians: Heart, liver and urinary bladder. Functions: 1. To calm and tranquilize the mind; 2. To invigorate the blood and release stagnation; 3. To promote urination. 1. Infantile convulsions and epilepsy: Amber (Hupo) is used with Centipede (Wugong) and Scorpion (Quanxie). 2. Palpitations, insomnia and dream-disturbed sleep: Amber (Hupo) is used with Wild jujube seed (Suanzaoren) and Multiflower knotweed (Yejiaoteng). 3. Dysmenorrhea or amenorrhea due to blood stagnation: Amber (Hupo) is used with Chinese angelica root (Danggui), Zedoary (Ezhu) and Lindera root (Wuyao) in the formula Hupo San. 4. Urinary tract disorders manifested as frequent urination, painful urination, bloody urine or calculus formation in the urinary tract: Amber (Hupo) is used with Lysimachia (Jinqiancao), Clematis stem (Mutong) and Imperata rhizome (Baimaogen). Dosage: 1.5-3 g (powder form).